This modern interpretation of classical architecture brings to the garden an arbor with timeless appeal. The top, with its keystoned pediment and the substantial side panels, with forms reminiscent of columns, help to establish these classical references. 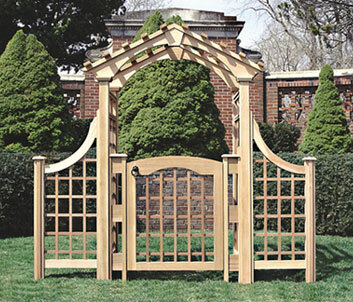 Available with or without the lattice extensions and the Garden Gate, as shown here, or with any of our other gate styles as referenced in the Arbor Gates and Extensions section. 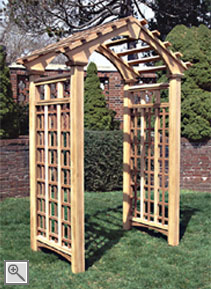 The walk-through opening for this arbor may be customized to any size up to 5'.